'Kirous" is the first demo to come from a band that sprung from the Finnish underground in the latter half of 2017. 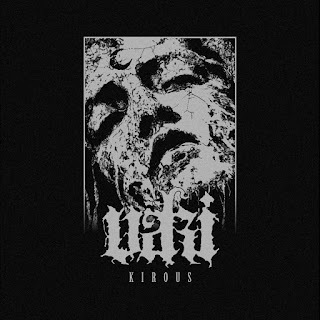 Väki, who formed in 2016, self-released their debut demo on cd and via digital means in October of last year before coming to the attention of rising label Redefining Darkness Records, who were so impressed that they released a limited tape run for the band. Not only that but Väki's strain of black metal has seen them share the stage with Taake recently in Finland's capital Helsinki. Finland’s recent black metal explosion has been well documented and Väki carry that explosion on with their debut demo. Kuoleman Säkeet is both hateful yet engaging and melodic (thanks to the guitars anyway!). The production and mastering brings out the band’s quality and their song-writing is both technical and passionate.They have room to add some native/folk-elements into their music towards the end too. It adds to what is already a blistering introduction. The title-track plays more on Väki’s metallic edge and contains more of a menacing atmosphere as well. Hints of post-metal can be heard through the gloom but that is quickly erased by the band’s off-kilter black metal. The pummelling drums, punctuated by crashing cymbals increase the noise-levels as the demo winds up towards a rapturous end. It’s insane to think that this is Väki’s debut release but the two songs present on “Kirous” give you mere taste of wha’s surely to come from the band. Excellent!